In the wee hours of Sunday morning, just as Daylight Savings Time kicked in, my delayed flight from Florida finally touched down in Baltimore, which is my home airport. I had been in Tampa for the previous four days, attending an enormous convention of writers, publishers, agents and representatives of writing programs. Each day there are over fifty panels on a wide variety of literary topics, or on the business of words; and there is also the enjoyment that comes from browsing the fair-like booths where thousands of different books are displayed, many of them by very unique independent presses. This was the first year I had ever gone, despite having been a writer for four decades, and it was a totally overwhelming and yet gratifying experience. I was lucky enough to be asked to participate on two different panels, speaking to large audiences about my books and the topics they raise, as well as making a host of new friends among a community of superb authors. And then, too, I was able to make connections with those who may be able to lend me a hand as I navigate through the rush of the publishing world. Despite the excitement of the trip, I came home exhausted. Although I had a editing client whose manuscript I was supposed to be finishing, I played hooky on Monday and snuggled up with an old favorite of mine, by A.A. Milne, published in 1926: The World of Pooh, a two volume series that includes Winnie-The-Pooh and The House at Pooh Corner. If you’ve never read it (scandalous!) it is a “children’s” book, (which Milne based upon his son’s childhood in England with his stuffed animal companions), wherein the young Christopher Robin lives in an imaginary forest along with a tribe of marvelous characters. These include his favorite Pooh, (who is often referred to as “A Bear of Little Brain” and generally to be found with his head stuck in a Hunny Pot, when he is not composing simple but commonsense poems). There are Piglet, Owl, Tigger, Eeyore, Rabbit, Kanga and Roo, as well. Each has a distinctive voice and speaks in his own clever and humorous way. 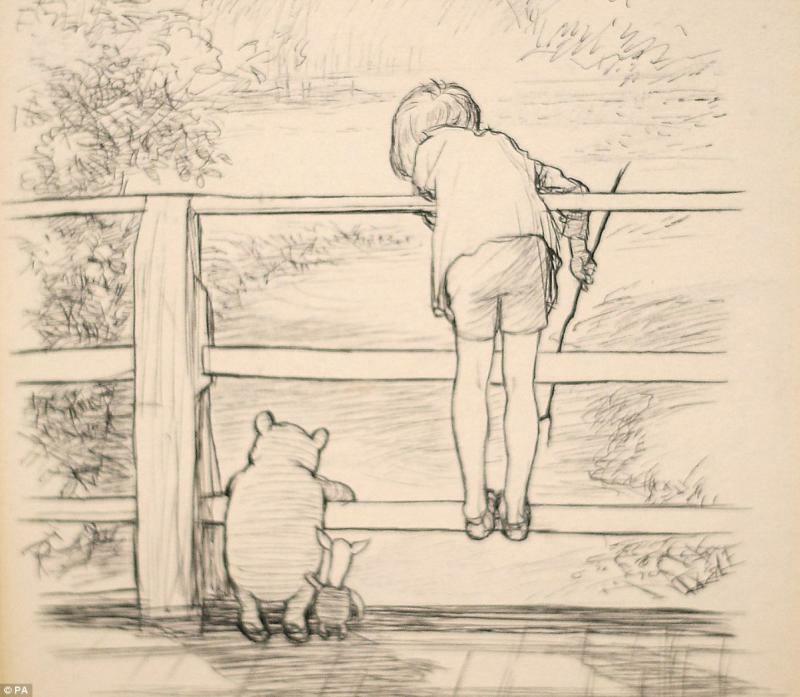 The pen and ink illustrations by E.H. Shepard capture Milne’s fantasy world beautifully; I can’t wait to read the books to my grandson when he is a bit older. “Where are we going?” said Pooh, hurrying after him. 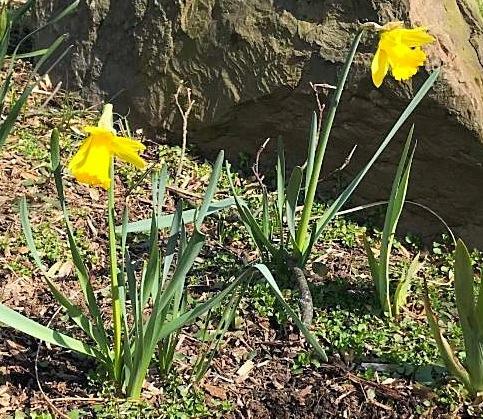 Yesterday, after lunchtime, I discovered the very first daffodil had stretched out its strong green neck up from the dirt in the garden bed beside my driveway as I had lounged inside whiling away the hours. Today, when I took a break from editing and went out to get the mail, two yellow faces were turned skyward, drinking in the sunshine. So the world goes when you are doing Nothing. Thank you, Mother Nature and Mr. Milne.